Congratulations Clarke McClymont on winning the GNW 100k race, your sub 10 hours time is simply amazing. I know you have been training hard for the GNW. How many hours a week did you manage to get out on the trail to train? Clarke McClymont: Hi Shona, only 1 day on the course with Beth(65km), other than that I just ran at home on the coast through the bush, beach, rocks and some cliff hikes. Shona; Your a tree arborist, how does your day job effect the way that you race? Your upper body strength is a stand out. My husband wants your guns [Mikey’s Editors note, I never actually said that Shona, maybe it’s you who wishes I had Clarke’s guns] , does this extra muscle change they way you run? Clarke McClymont: Yeah I’m an arborist and climb trees for a living. It definately effects the way and the amount of training I do. I don’t run as much as others, some days I’m too drained after work or the surf’s good so I don’t bother. I don’t think it works in my favour having upper body strength, it means I have more to carry and I have trouble getting under 68kg. It also means I have to fuel my body more than the average running whippet. Shona; Your profession is really physical, do you have to modify your training to allow for fatigue? Shona; GNW 100 is almost in your back yard. Do you believe that knowing the trail give’s you an advantage considering that so many competitors get lost in the event? Clarke McClymont: Yes, course knowledge is a big one, more so on GNW because its so poorly maintained and marked, in saying that I’ve been lost after doing the course many times. Shona; Do you like to train with a friend? Or alone? 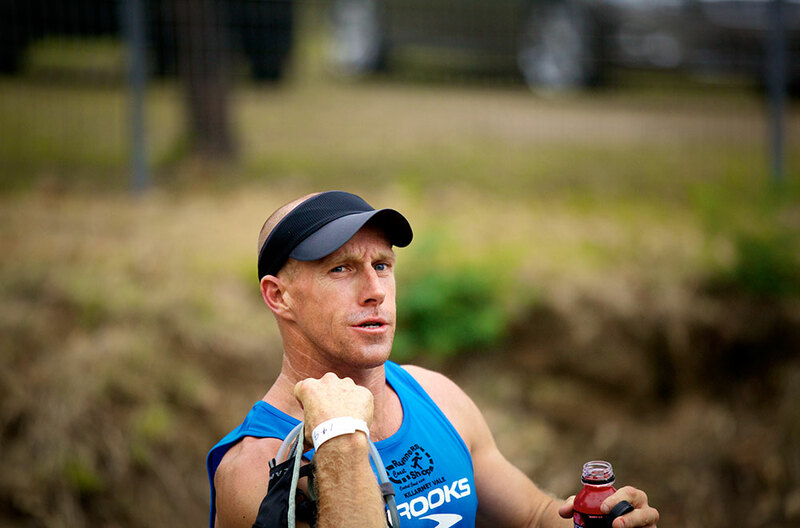 Clarke McClymont: I always trained on my own for years, then I met my wife Tiff and I’ve run alot with her and our dog Cooba, but Tiff is having a baby now so training has been mostly with Cooba. Shona; What is your favourite training session? Clarke McClymont: Its a bit of a love/hate thing for me. I kinda don’t like training but love being fit and the feeling after training. I more enjoy other sports like surfing, free diving and boxing that are super fun with an adrenaline aspect involved, but since going to Europe this year I have been most impressed with skyrunning and the terrain involved . I love running down steep technical paths. Shona; I love the steep downhills too. You came 36th in the shortened UTMB in 2012. Ranking the top Australian in the developing event. What was the key stand out lessons that you learnt from racing in Europe? Clarke McClymont: Going to Europe and hanging with Marcus and seeing the way the European runners approach their sport taught me alot about race preperation and if you want to acheive you need to be serious right down to the finest of details. These runners took their gear seriously , diet , sleep and training. Everything was structured with the intent of performing on ‘race day’. In saying all that I still think I could have performed much better over there, my checkpoint times were pretty bad and I didn’t fuel myself as well as I did in the GNW100k. I’d love to have another crack at it !! Shona; What are your strengths when you are racing? Clarke McClymont: Probably technical downhill and super steep climbing (not runnable).I’m not as speedy as other runners but can manage to stay consistent through a race. Shona: What is your nutrition and Hydration plan when you are racing? Does it differ from when you are training? Clarke McClymont: This is something I think I’ve only just got a hold on , I use gels every 30min with an enduralyte on the hour with space food sticks or lollies every 15min and just water in my pack. I generally don’t run much further than 20km in training so don’t bother fuelling . Shona; You climb trees all day long as part of your own business, what other forms of exercise do you enjoy? Clarke McClymont: I’ve been a surfer since about 12yrs old and rarely miss a swell to this day, so surfing has always had priority. Other sports kind-of revolve around the ocean – spearfishing, fishing, catamaraning, paddling and on land I love boxing and bikram yoga. Shona; Have you had any injuries that you have had to manage in the past? Clarke McClymont: Yes, I’ve had injuries in the past , torn calf, rolled ankles, sore knees and still have a right archillies that the same diameter as a rolling pin !! Shona; How have you managed to re-hab these injuries? Clarke McClymont: Just don’t let them stop you. Many runners look for any injury to explain why they’re not there on race day, that’s a heartlage injury, alot of injuries can be managed by backing off a little and cross training to maintain fitness(listen to your body). Shona: What sorts of sports did you play as a kid? Clarke McClymont: Gee… as a kid I loved BMX, little athletics, squad swimming but mostly I think I was just causing trouble: rock wars, stick fights and generally just doing stupid dangerous things. I think I had too much energy…..schools suffered too or at least the teachers did !! Shona: How have you evolved into such an awesome trail runner? My husband Mikey says that you run like “Wolverine”. You are just pure power and force. Clarke McClymont: Wolverine – that frigin’ Gordi !! 2011 was a defining year for me, Brendan Davies asked me to be apart of No Roads Expeditions trail team and that scared the ‘perghebbers’ out of me because in that team was, himself , Andrew Lee and Mick Donges and these were blokes that I only saw the back of in races, so I increased my training and expanded my focus to track sessions as well to try and introduce more speed into my races. Shona: What are your racing plans for the next 6 month to a year? Clarke McClymont: I’ll start off the year with 6ft Track , Three Peaks , North Face 100 , GNW, with smaller races scattered in between. BUT I’d love to do UTMB again or a skyrunning event. Shona; What shoes do you like to wear? You can name a few, Trail, Road etc? Hey Clarke thanks for the interview. You are an amazing runner. I hope you enjoy some time off and rest and recover before your next big adventure.